Breakfast For Lunch Bento, Pt. 3, a photo by sherimiya ♥ on Flickr. Breakfast for lunch day! (See BFL bentos 1 and 2 here) Woohoo! I was looking at my EcoDipper containers and happened to notice that they are perfectly sized for whole wheat sandwich mini thins. I took it as a sign to make a sandwich! The EcoDippers are ideal for sandwiches because while their lids slide on securely, they are not watertight. The food inside won't condense and get soggy with temperature changes, which is nice for the food I've packed today. I made a fried egg with shredded spinach in my cute mini round fry pan, which happens to be sized perfectly for both the sandwich thin and the EcoDipper. Is that cool or what? If I had some Canadian bacon, this would have been a cinch. As it was, I only had deli ham (nitrite-free), so I folded it to fit. I also toasted the breads with grated cheddar. I topped the sandwich with a jack cheese bear face and put that into one EcoDipper. I packed the other with a variety of treats: tiny satsuma mandarin, grape, strawberry, house-pickled cucumbers, and a couple of steamed Okinawan sweet potato slices. 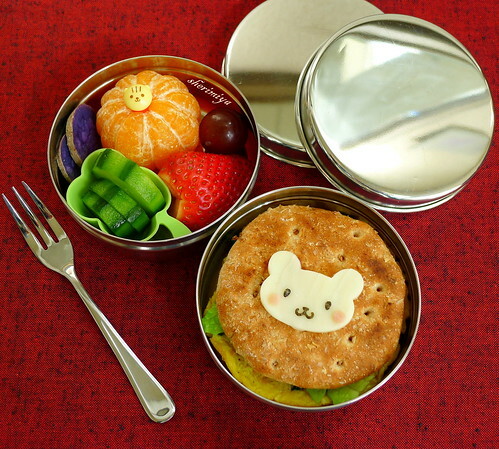 What a cute little TinySprite-sized bento set, don't you think? We JUST bought these wheat sandwich mini thins at Costco because my son really wanted to get it after tasting it at the store. When I look at the picture first I was wondering if it is..and I was right! How funny. I haven't packed that for lunch yet, but I feel like this will be a great packaging! The mini thins are perfect for little appetites! I had to pack three for my son though, heh. I like them because they're not so filling that the kids will get full just on bread. Have fun making little sandwiches for your little one!